"Bosket's Alimentos" - meaning Bosket's Food is completely vegetarian (not even eggs) food blog with lots of healthy and fusion recipes prepared with lots of love in our own kitchen. "We don't Prepare food, Rather We DESIGN it in our own way." We believe in eating simple, original and whole food which is prepared from scratch at home only. We do visit many new places at times and explore more and more new dishes and techniques of cooking as well which we try to implement in our kitchen with some twists (sometimes). Both of us are die-hard fan of eating new food, experimenting with food and prepare some fusion dishes. We believe that the food we eat defines who we are. We really enjoy cooking as a relaxing unwinding activity. Recipes on "Bosket's Alimentos" range from authentic Gujarati cooking to very innovative / experimental cooking as well as baking. While as being a Gujarati and very much fond of authentic Gujarati food and eating that on day-to-day basis; we both are very passionate about global cuisine new experimental dishes. We love to experiment in our kitchen and as the result we come up with the signature dishes most of the time with our own twist into it. You will find a range of international dishes with our twist on this blog too. Born in 'sanskari-nagari' Vadodara, Gujarat in a pure vegetarian lohana family. Studying Chartered Accountancy and a fun loving person by heart. Married with Ketul Shah (Software Analyst by profession) and moved here to Bangalore, Southern Karnataka. Fond of trying new things especially in kitchen. Love to Keep on trying and learning new things by exploring different places.I love trying all the new cuisines at homes by researching a lot on it. I love to prepare international dishes in my own twists. Born in Petlad, Gujarat in a pure Vegetarian Vaishnav family. Moved to Bangalore for career (working in Robotics Field) and till then got chances to explore many places across India as well as few places out side India. So much fond of different kinds of cuisines and also loves to try them all in my own way. Likewise Boskey, I also love trying my hands on different types of cuisines. In fact, both of us always put efforts together to try different dishes at own kitchen to prepare them with some twists and specially added ingredient which we call "Love"; and as result, we have prepared many unique and signature dishes which we call "Fusion Dishes". P.S. 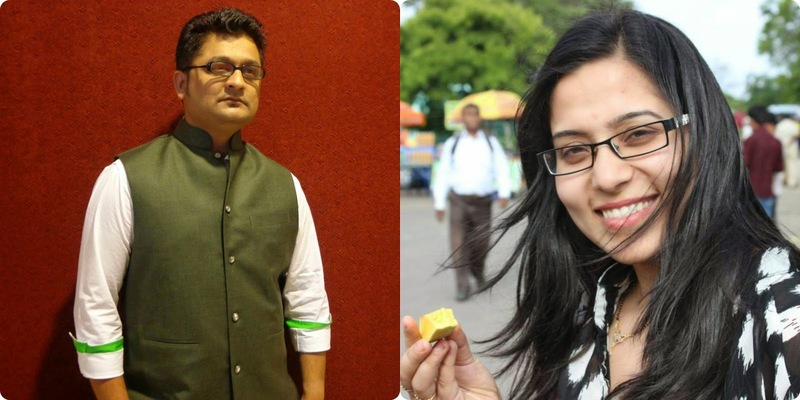 : Both of us, basically grown up seeing and eating the pure Gujarati food from the childhood, gained knowledge of cooking and sense of innovation from the elders at homes. Thus, almost all the recipes on this blog, are purely dedicated to both parents. You will find many recipes which are prepared authentic Gujarati style. All the pictures of the food are taken by us and completely owned by us only. Being an amateur photographer started taking pictures of the recipes we prepare all the time with Sony Digital Camera (No DSLR). Most of the pictures then taken by my Sony Xperia T2 Ultra Phone which is available on this blog. After starting research and work for this blog, we realize that food photography is one of the most important aspects for food blog. We spent hours of learning new techniques and way of food photography. Still we use no DSLR cameras but only the features available on phone and Sony digital Camera(16MP) and Sony Xperia T2 Ultra phone(13 MP Camera and almost all DSLR features) for photography of recipes available on this blog. This blog is open for promotions and advertising of food products, food joints which is seriously match our philosophy and belief. Being a strict Vegetarian people, we are completely against non-vegetarian, ecological harmful, overly processed and even containing eggs food. And we will not entertain such things on this blog. Advertising and promotions of the food product or food joints or startups on this blog will completely be our decision. We love to explore many new types of food and cuisines. So, We will also love to share our experiences on those new places where we find the food and recipes as per our philosophy. We are keen to take up Food Photography and Food Writing projects, which are really exciting and challenging. We would prefer the assignments, which allow us to work from home. This blog can be considered as our short portfolio. Anyone, feel it's suitable for any kind of above mentioned projects, then feel free to contact us. !!! Everyone is free to write us in comments / email / Messages at any time. We will surely try to reply you all guys as soon as possible. We feel that your feedbacks and comments will act as fuel for our work and this blog too. So Keep Writing...and let us make this work for you at its best.